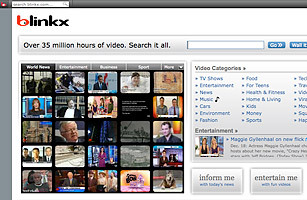 Search for TV news clips and other video bits from more than two dozen sources, including ABC News, BBC News, Fox News, ESPN and C-Span. There's plenty of lighter fare, tooa search for Nicole Kidman pulled up a documentary clip from Biography.com and assorted movie reviews and trailers. Blinkx has its own way of indexing clips that makes it more effective than other video search engines for finding particular segments within a broadcast, and each video stream starts off at the point in the segment that's most relevant to your query.